Obituary for Leslie Wareham | Crandall Funeral Home Inc. It is with great sadness that the families of Leslie Wareham announce her passing on September 17, 2018 after a short battle with cancer. Leslie was born on May 19, 1953 in Craig, Colorado to Sarah Rae (Smith) and Clyde Seth Wareham. In 2016 after 40 years, she retired from (Allied, General Chemical) TATA Soda Ash, where she was an electrician and mine mechanic. 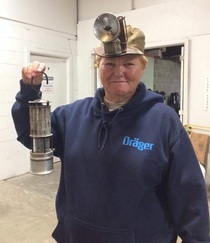 She was a member of the Mine Rescue Blue Team and was the first woman to be inducted into the MSHA Hall of Fame. Leslie was an active member of Uinta County Search and Rescue and former member of the Mountain View Fire Department. Over the years she enjoyed numerous activities including softball, hunting and bowling. She loved working with her horses and riding. Leslie is survived by her brother, James (Lorna) Morrey and her adopted sisters, Dawn Putnam, Valorie (Jeff) Downey and Pam (Carl) Ivie. Leslie is preceded in death by her parents and siblings, Cora Jean Swenson and brother in law Jack and a brother Curtis Bud Allread. Leslie will also be forever remembered by her numerous nieces, nephews and extended family and friends. A visitation will be held Thursday, September 20, 2018 from 6:00-8:00 PM at Crandall Funeral Home in Evanston. A graveside service will take place at Fort Bridger Cemetery on Friday September 21, 2018 at 11:00 AM followed by a luncheon at the LDS Church in Mountain View, Wyoming. The family would like to thank the doctors and nurses at the Huntsman Cancer Center and also to Cowboy Cares. Donations in Leslie’s memory may be made to: Hope Lodge Salt Lake City or to the Uinta County Search and Rescue.